The 13th Annual Long Lake Ice Fishing Derby has been approved for 27,28 January 2018. We have increased our cash purse to $17,000 this year and we will be giving away another Sport Shack Ice Shack with a custom cedar interior by Voisine Cedar Mill in Frenchville. All 2 day registered anglers are entered in the free drawing for the Sport Shack. Does anyone have recommendations for a place to stay up there? Cabin rentals/ hotel?? Long lake in Naples Maine? No not the Long Lake in Naples, it's the one way up North. Poster for this years derby and a link if you want to down load one. Will post more as its available. We would like to thank Up North-S.W. Collins and Varney Agency for their continued support for the Ultimate Ice Fishing Package. Chances are only available when you register. and older) must possess a valid Maine fishing license. • The derby starts at 12:01 AM on Saturday January 27, 2018.
prizes. 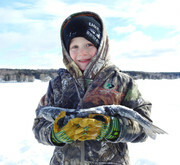 All State of Maine ice fishing regulations pertaining to these lakes and waters will apply. is the Long Lake Sporting Club, 48 Sinclair Road, Sinclair, ME. (207) 543-7584. River must be registered and weighed at “Base Camp”, Long Lake Sporting Club. • Weigh station for MUSKIE ONLY is Joe’s Country Store, 1005 Main Street, St. Francis, ME. CAMP” (Long Lake Sporting Club). identified day selected on registration form. longest will be the winner). • Derby officials must witness all weigh-in and measurements of fish. • Weigh stations will be open at 7:00 AM and close at 5:30 PM sharp on both days. registrations will only be accepted at the Long lake Sporting Club, 48 Sinclair Road, Sinclair, ME. • Participants are not required but are encouraged to be present at awards ceremony. • All awards will be presented at 6:30 PM sharp on Sunday, January 28th at “Base Camp”. COUNT TOWARDS YOUR LEGAL POSSESSION LIMIT!!!! of fish, lake, and approximate time of catch. Fishing Derby at 493-3318 (work), 227-5252 (cell), 543-6332 (home), email paul@aroostook.me.us. St.Froid Lake Camps and Campground is a good place to stay. Ice is getting there!!! Real cold week!! We have Derby clothing and calendars this year. Ø Derby clothing will also be for sale. Ø Big Country 96.9 will be advertising all week up to Friday, the 26th. Here are pics of the Sport Shack we are giving away to a 2 Day registered Angler - if you are registered for 2 days you will automaticlly be entered for the drawing - DO NOT have to be present to win. The logos are from the Diamond Sponsors of the derby - these businesses have supplied the finanacial and logistcal support we need to make this derby happen. It is because of their dedication and generosity to the derby that we are able to provide prizes like this to our anglers, while raising money for the Edgar J Paradis Cancer Fund. 3 more days and me and my crew will be up there for this derby. I can't wait to get there. Gerry T Band - Registrations - Derby Clothing - Door Prizes for registered anglers!!! The Sport Shack we are giving away is at the Lakeview now!! The fantastic tongue & groove interior was done by Reno at Voisine Cedar Mill in Frenchville - Thanks Reno!! Any update on ice conditions? Looking at about 2' of ice on most of the lakes up here. Square has maybe 18". I drove all over Long with a vehicle before this last storm but now there is about a foot of drifting snow on the lake. I heard the ice is so thick on Eagle that planes are landing on it. I heard the ice is so thick on Eagle that planes are landing on it. Unlike earlier this year when they were landing IN it. Lots of Fish - Lots of anglers. NICE Trout & Salmon !!!!! One of our best Anglers!! !